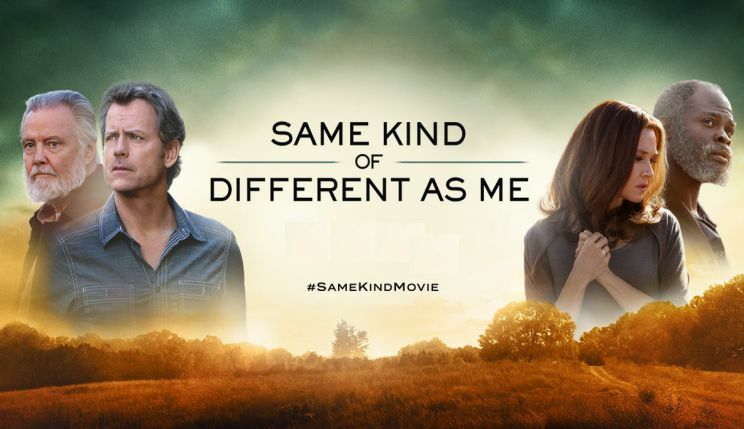 Based on the book of the same name which is based on a true story, Same Kind of Different as Me is the unlikely story of the intersection of two worlds between an international dealer in expensive fine art and a homeless man who spent much of his life working overtime as a slave. Ron Hall is living the good life that involves interacting with high society when his wife Deborah drags him to reluctantly serve at the Union Gospel Mission. 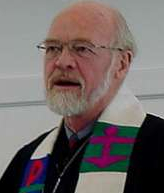 The 2007 book from Thomas Nelson later gave way to a small group curriculum as it raises many issues. I had only minimal familiarity with the book — I knew it had sold well in some areas, which can be hard for a biographical work even if it reads better than some fiction — when invited to see the movie which, as you read this, is at the end of its second week in North America. My wife and I were quite impressed. She even paid it the ultimate compliment (for her) by saying something as we left the theater, “It wasn’t a Christian movie;” by which she meant there wasn’t an overt gospel message leading toward key characters getting saved at the end. Indeed, this is actually the ideal Christian movie, where things are shown instead of told, and where Christian values are being lived out, rather than simply taught. Truly this is the Christian film you view with that unchurched neighbor, coworker or relative. But it takes more than just a great screenplay to make a great picture. The additional points would go for some very plausible casting — I felt like I already know Ron and Deborah — and some rather breathtaking scenery, not to mention the visual image of the place in the woods where the homeless of that community spend the night. The movie raises the possibility of much discussion about the type of activity which truly helps the homeless and gives them dignity and how, at the end of the day, we’re not all that different. Thanks to Tim at Graf-Martin Communications, Inc. for the tix. I use the word a lot. Perhaps even overuse it. The word? Apologetics. I’m a fan. A huge fan. Apologetics isn’t a necessarily an element of systematic theology. I way that because it’s been noted that the word doesn’t appear in many theological texts. But it’s definitely a branch of evangelism, and some would argue it’s at the core of Christian outreach. Relying heavily on logic, it defends Christian belief from detractors and skeptics. But it’s not child’s play, right? Or is it? J. Warner Wallace, author of Cold Case Christianity and God’s Crime Scene would have you think differently. The former book was spun off into a kids edition and earlier in the year, some friends surprised me with the news that they were suspending their usual Sunday School curriculum for one quarter, and instead take the 13 weeks to look at Cold Case Christianity for Kids. So I was delighted the other day to receive a sample copy of the kids edition of the second book in the series, in the form of God’s Crime Scene for Kids. While the first book (in either the adult or children’s series) looks at the evidence for the resurrection, the second looks at creation, or the evidence for what some call intelligent design. Can my friends’ 9-12 year olds absorb that? With his trademark illustrations, J. Warner Wallace offers entirely new analogies to help kids see the trail of evidence leading to a creator. There are more pictures than the adult edition, but these images help bridge the distance between ostensibly difficult content and a child’s imagination. There is also a website with supporting videos for each chapter hosted by the author. Let me suggest an analogy of my own. Parents often ask me about the difference between the NIV Bible and the NIrV Bible for children. I explain that for easy readability, the latter uses shorter sentences and a reduced vocabulary, but when it comes to people names, place names and the storyline itself, there are some things that can’t be dumbed down or tampered with. Similarly, Wallace tosses out terms like causation and reasonable inference like they were after-school snacks, but only because he’s convinced that in the context of the book they’re holding in their hands kids can grasp these concepts. (A cat named Simba bears some of the responsibility for keeping the story accessible to young minds.) He gives kids credit for being able to understand more than we might estimate. I think the presence of a book like this could open a lot of doors to discussion that would cut across all age lines. A two-in-one blog post repeating my reviews of Cold Case Christianity and God’s Crime Scene. The Case for Making the Case; my review of the more recent book Forensic Faith. The full title is God’s Crime Scene: Investigate Creation with a Real Detective, David C. Cook, 2017; 144 pages, paperback. A copy of the book was provided by the publisher. Yesterday I had a nearly one-hour conversation with a couple who belong to a denomination which I can easily say would be somewhat fringe, and one I had never heard of before. While we agreed on many things, we differed as to the terminology; and while many elements of our worship services would be similar, there were some that would no doubt be unfamiliar. It was interesting, to say the least. I’m very hesitant to take this conversation and turn it into blog material, but there is one particular aspect to our discussion which struck me. When this couple spoke about their doctrine and beliefs, they spoke as one voice. That is to say, their depth of understanding was at the same level for both, and never once did they even hint at contradicting each other on the interpretation of what it is their church teaches. The cynic in me would want to suggest that perhaps they have simply been programmed with the same ‘party line’ on these matters, but their passion was too intense for these to be rote responses. And their passion was indeed great. They certainly left me thinking and wanting to explore some of these areas further. I wish I had recorded the conversation. I would be unlikely to sign on to the entirety of their Biblical approach, but they left earning my highest respect. But it was the marital aspect I wanted to leave you with here. The husband and wife were as unified as any two people I’ve ever seen, especially in a discussion that was high intensity. The things they spoke of really mattered, and their desire wasn’t to hit me over the head with their hermeneutic framework, but rather they seemed to care that I also take what they said to heart. They also equally enjoyed spending the time together doing this; neither was more or less in a hurry to leave than the other. So today’s question is for married couples: Do you speak with a single voice on matters of Christian doctrine, Christian ethics, and Biblical understanding? Or is one voice stronger than the other; does one defer to the other? Or do you differ on matters of doctrinal standing? Or are you perhaps in a marriage where one is a believer and one is not? I don’t have a lot of hobbies, so I thrive on faith-focused conversations. These usually take two forms. The first is conversations with those outside the faith. I’ve learned a few things over the years about theodicy, that branch of apologetics which attempts to explain the nuances of Christianity to outsiders. I thrive on this. Just hours before writing this, I was talking to a pastor about a church we visited when our kids were small which had a staff member designated as “Minister of Assimilation.” Aside from any weird science-fiction imagery, I liked the idea of integrating new people into the family and explaining how the family operates, our traditions and our key values. I know I live a lot of my life in the Evangelical bubble but it is strange to be in an environment where a faith-focused conversation is elusive. We met some people from Sydney so I asked them if they had heard of Hillsong. They had but that was the end of it. This has happened many times. I toss out key words. I quote Jesus as casually as if I’m quoting Mark Twain. The conversation shuts down. No one takes the bait. Now I know why Missionaries work so long before they see results. So aside from noting my brilliant alliterative update to the “Liar, Lunatic or Lord” apologetic, I think you can see the frustration that I was experiencing. I really, really wanted to find someone to connect with over the thing that most excites me (church, Bible, worship, teaching). Or the One (Jesus). It was bad enough touring through a very post-Christian society without having to face it on the boat. Supposedly about 37% of my fellow travelers were American. So where were the Southern Baptist Republicans I’ve heard so much about? Not, as it turns out, on an expensive river cruise with an open bar. Four days later we discovered over lunch that one of the four people from Sydney was a Christian. Same denomination as I am, in fact. I looked forward to continuing the conversation and learning more about her church, but we never actually connected past that point in the trip. Sidebar: Be prepared. I packed three (different) Bibles to give away to people I met on the trip… and I brought three Bibles home with me. Just never had that sense to go ahead and give one. That’s a first. Raising children, including one who would have been considered special needs at the time. My health; though we did take some road trips. Economics, especially in the sense of affording air travel. My parents health which perhaps wasn’t always as much a barrier as we thought, but certainly did require us to be in daily contact, which would have complicated an overseas holiday. 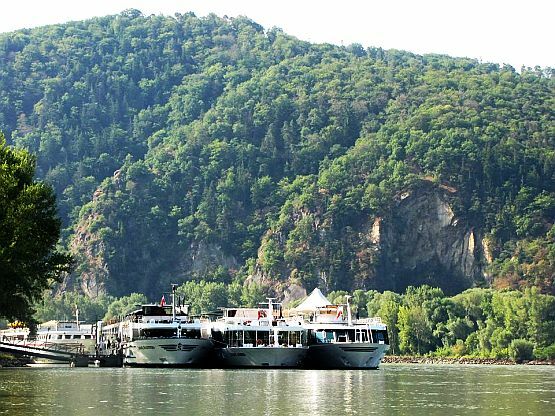 So when the opportunity to catch up arose, we selected a package which took us to Hungary, Austria, Germany and the Czech Republic. We also passed through Slovakia which I later got to visit more closely while Ruth took a different side trip. As familiar as sightseeing destinations are in Paris and England and Rome, the recent terrorist activity in the first two doesn’t lend itself to worry-free touring. (I’ll grant that Germany has not escaped such events.) So we chose this particular set of countries. They were different. They were unknown. They were a nine-hour flight away. The trip was certainly eye-opening. As I sit typing this at 5:45 in the morning — my body confused by the six hour time difference — I am reminded particularly of our reaction the first day to the historical sections of Budapest on our first full day, and our first glimpse of the old town of Prague last Wednesday. It was surreal. We were there. It wasn’t a movie set. We saw it. We felt the bricks. 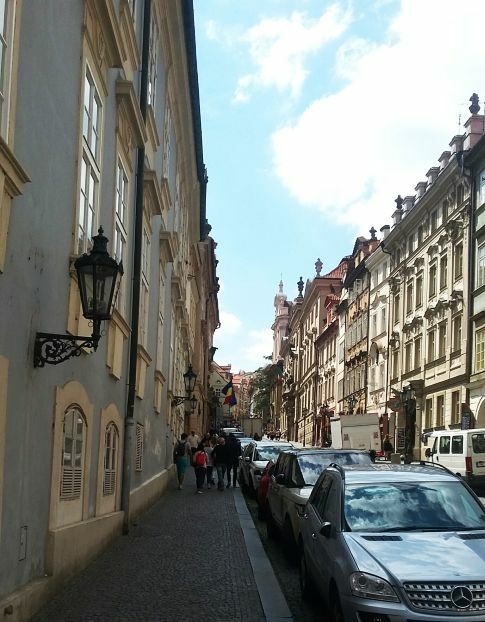 We walked on the cobblestones. We pinched ourselves a few times to make sure it wasn’t a dream. Europe is also all about cathedrals. Our last tour director — the trip was in two stages — told us that many travelers reach a the ABC stage, meaning “Another bloody castle.” But they might also say, “Another bloody cathedral.” You know your brain is saturated when, knowing the ornateness and beauty that awaits inside, you pass by because you are simply cathedraled-out. and other topics as I think of them and go through our pictures. So that’s the line-up for this week, plus hopefully a return of the link list on Wednesday. If you don’t want to hear about someone’s holiday excursion when having one of your own seems remote right now, please understand I totally get that. Note: Some will find this article is built on a rather pessimistic or negative premise, but I hope you’ll buy in and see the lesson in this. As I started thinking about that, I realized that a fire is a rather superficial reason for abandoning the faith, though I can’t say what bitterness could steal my heart in similar circumstances. I have often said to close friends that I become an atheist every night around 4:00 AM when after several hours of tossing and turning I can’t get into some deep sleep. I hope they know what I’m saying and don’t take it too literally. Again, superficial things. Last week I started thinking what superficial factors could plunge me into a cycle of questioning the reality of the Christ story. I don’t mean this in the sense that I’m having a faith crisis, or that any such factors would be successful, but I wanted to better understand my own vulnerabilities. Here are two I came up with. 1. Natural disasters. This is of course a reason often used by non-believers for not embracing the idea of deity. “How could a loving God allow this to happen?” But as I watch World News Tonight with David Muir each evening and see peoples’ homes washed away, it does seem a great moment for divine intervention that didn’t take place. Remember, we’re talking about potential vulnerabilities here. 2. The actions of fellow Christians. This was the one C.S. Lewis said could prevent just about anyone from becoming a Christian. When I think of the hurt I’ve endured at the hands of fellow believers, I can very easily imagine a person of weaker faith abandoning ship. What personal circumstances or things in your life have the potential to eat at your core faith? What is the weak link in your faith chain? “So the one who thinks he is standing firm should be careful not to fall.” – 1 Cor. 10:12 Berean Study Bible. As the counselors added new logs to the fire the sparks would rise high into the night sky. It was Friday night, the last night, and it was testimony night, and camp staff and campers took turns sharing their testimony. Knowing what I now know about liturgical churches, I’m not sure where the equivalent forum is to share a testimony in those denominations, but if you’re Evangelical, such opportunities are everywhere. Here are some things to consider when they pass the microphone to you. 1. What happened way back then? Most people have a before and after story. There is your story what Andy Stanley would call a pivotal circumstance, what David Jeremiah would call a turning point. I once was lost but now I’m found, was blind but now I see. That sorta thing. Be sure to mention Jesus. 2. Was this a gradual thing or did it happen all at once? In my denomination, the former is called process conversion and the latter is crisis conversion. Choose your answer carefully because some critics on the sideline will question the nuances of either. God works in mysterious ways. 3. What other significant events have marked your life in Christ? Most people will think in terms of crossing the line of faith as a one time thing, but hopefully there have been other markers in your story. Baptized? Volunteered to work with kids? Started a blog? 4. Were they part of a gradual climb, or was it more incremental; more step-by-step? If you want to be honest this is a good time to say that some times it’s one step forward and two steps backward. Some periods in our lives will find us more responsive. 5. What scripture verse(s) or passage(s) has been helpful in explaining, confirming, affirming your relationship to Jesus? People aren’t looking for a particular life verse, perhaps it’s more a matter of some common ground you’ve found with a Biblical character, or a promise that has been particular helpful. 6. If you knew then what you know now, would you have done anything different? There may be something in your story that will help someone in the audience who is facing a tough situation or difficult decision. 7. What about more recently? What happened this week, yesterday or this morning? A testimony that is solely about something that happened 35 years ago isn’t a testimony to the power of God active in your life today. 8. Why should someone want to experience what has happened to you? You want to remind your hearers that the response to your story is to look at their own lives and see if there’s a next step in their future. One of my all-time favorite testimonies: Nancyjo Mann from the Christian band Barnabas. Copied from a VHS tape. The image at the top is a composite of baptism videos from North Point Community Church. Before being baptized, each candidate is required to make a 2-4 minute video sharing their salvation story. It’s become a recurring theme: Someone wants to help out at church but their spiritual status is not-yet-arrived, ambiguous, or hard to authenticate. Parking lot duty? Not a big issue; but many seeking an avenue of service are looking at the platform; so many of these requests involve music ministry or something related. That’s what’s at the heart of the movie The Resurrection of Gavin Stone which after a brief theatrical run is now releasing on DVD. In this case, the protagonist is looking to be involved with the church’s annual drama production. His theology is sketchy, to put it kindly. But in addition to being very good at acting, he’s also a former child star still possessing considerable name recognition. The director isn’t really torn. She sees this as not conforming to the requirement that platform participants share a testimony of life change through Jesus Christ. But the senior pastor, who also happens to be her father, is more open to the possibility that God is offering the church a rare opportunity to do something which will both bless the actor and bless the church. So for the first premise-introducing one-third of the film it’s a simple matter of laying out the plot. During the next third, my attitude was, “This isn’t that bad.” But by the final third of the movie they had won me over. Even my wife who is usually a tough critic when it comes to Christian cinema was very positive toward the film. It wasn’t the authenticity of the portrayal of the various characters, though that was extremely good. It wasn’t the realism of the sets and location shots, though they were well done. Rather, it was the genuine nature of the problem; namely that churches we know are wrestling with this issue all the time now and someone has finally fleshed this out in a screenplay. Fans of The Middle on ABC-TV will recognize Neil Flynn who plays Gavin Stone’s father. Tangential perhaps, but interesting that Middle co-star Patricia Heaton has been a force behind Affirm Films. Not so tangential was my wife’s comparison between The Resurrection of Gavin Stone and Heaton’s Moms Night Out. Worldwide rights for this picture however were purchased by WWE Studios, and wrestler Shawn Michaels has a significant role in this picture as well. In the first few minutes, we recognized a hallway from Harvest Bible Chapel’s Elgin, Illinois campus where much of the filming took place. Again, it’s entirely plausible that a church like Harvest would face a dilemma such as what to do with Gavin Stone. At the end of the day, this is a romantic comedy. While ecclesiastic nerds like myself might get lost in the doctrinal quandaries of qualifications for service, you don’t have to be a regular church attender or even a Christian at all to get the tension in the plot. Which is, come to think of it, exactly what the movie is all about. I mentioned a few weeks ago that twice a year I am asked to write a devotion for our local newspaper. It presents a number of challenges, not the least of which is trying to keep it under 550 words. If I I’m writing for C201, I don’t include things that begin with illustrations; we cut to the chase of studying text. But I have to include some type of local references, to our town about an hour east of Toronto. I thought I would share with you what I came up with awhile ago. Your comments are invited. As I mentally scan the map, I can’t think of any place along the southern tier of Canada where it’s possible to be so close to the U.S. border but have to drive so far to get there. On a clear day, you can see a generating station’s smokestack across the lake with the naked eye, but entering New York State involves either a nearly two-hour drive in either direction to reach a border point. In many ways, it’s a metaphor for the relationship that Canadians, especially in the days before today’s religious pluralism, had with Christianity. Even now, many sit camped out on the edge of belief. They might even hold church membership or do volunteer work, but a spiritual heart examination would show that they’ve never crossed the border of commitment; they’ve never placed themselves, by faith, under the covering of the cross. Just as we can watch U.S. television stations and listen to its radio so easily, because the border is so close, we live in a time and place which has been influenced by Christianity, but still, many hesitate to fully enter in, to fully engage, because, figuratively speaking, the drive to the border is too long. Nothing of urgency has forced us to make the trip. In Acts 26, we read the story of an encounter between the Apostle Paul and King Agrippa. This is Paul’s moment to secure his release from custody, but from a legal standpoint, he squanders the opportunity and instead tells Agrippa the basis for his belief that Jesus is the long-anticipated Messiah, the deliverer of Israel in particular and mankind in general. But Paul calmly reminds him that none of the occurrences in the Jesus story were made up, nothing was done in secret, “for this thing was not done in a corner.” (vs. 26, KJV) Agrippa and Festus need merely to check out back issues of The Jersualem Times to read the accounts for themselves of Jesus’ teaching, miracles and crucifixion. But a few short verses later the scene ends. We’re left with the picture of King Agrippa camped out on the border of belief, but, to return to our analogy again, he never gasses up the car and makes the run for the border. Full commitment is in view, he can see it with the naked eye, but nothing of urgency forces him to make the trip that day. Originally, I never thought of it in PTSD terms, and it’s not like I did a tour of duty in the Middle East. Instead, it started our gradually, with phone calls from the seniors’ home where my mom was living. The calls always came late at night, when the staff were wrapping up paperwork once the residents were sleeping. She had another fall today. They’re putting on her a new medicine. We’ve noticed she’s not eating so much. The doctor’s concerned about her circulation. I realize these health care workers have a responsibility to notify families, but the calls always came at an hour when we were winding down for the evening and wanted to relax, not deal with tension. We asked for “emergencies only” notification, but we had different definitions as to what constituted an emergency. It got to where every time the phone would ring I would tense up, and now that she’s gone, the after-effects of this stress continue. Telephones often bring bad news. Especially now when other forms of communication happen through email or on social media or texts. Four years ago, long before the worst of this experience was to take place, I recognized that having a calming ringtone doesn’t change the fact that it’s a phone call. So again, while I wasn’t in Iraq or Afghanistan, I do have little bit of empathy for people who are bound by Post Traumatic Stress Disorder. It’s no fun living with anxiety, stress and tension and while having a strong faith and trust in God ideally brings peace amid the chaos, it doesn’t always work that way. Rather, the disconnect between the elements of faith we profess regarding God’s sovereignty and protection, and the inner turmoil we’re experiencing in the situation; that disconnect only adds to the problem. A person dealing with PTSD is a person in desperate need of joy.